Market Rasen twins Tom and Tim Neave (19) were competing in the second round of the Thundersport GB 600 Sportsman Elite championship at Donington Park at the weekend. Riding his Stock 600 Kawasaki, Tom qualified in fourth position for Saturday’s opening race, which he started from a second row grid position. Tom went on to complete the 14-lap affair in a strong fifth place and was anticipating two more good results from Sunday’s two races where he was to start from the fifth row. In blustery but dry conditions Tom settled into fifth place at the start of Sunday’s first race but as the laps wore on he reeled in his brother Tim. By lap seven he was in front of his brother but Tim retook the position with two laps remaining. Alex Baker snatched fifth place on the last lap leaving Tom to complete his race in sixth position. The last race of the day produced Tom’s best result of the weekend as he completed the race in second place. Meanwhile Tim qualified for Saturday’s race in ninth place and after starting from the fifth row he crossed the finish line in seventh position. Starting Sunday’s opening race from the third row he battled with his brother for position and finished ahead of him in fourth place. In his final race Tom again began from row five, 15th place, but in wet conditions battled through and rode out of his skin to not only win the race, but win by an impressive 24.9 seconds. 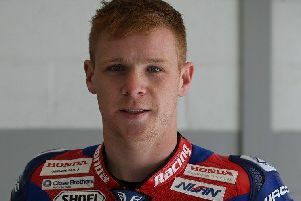 The next round is at Snetterton over the weekend of May 3-4 but prior to that Tom returns to National Superstock 600 at Brands Hatch this weekend, April 17-19.